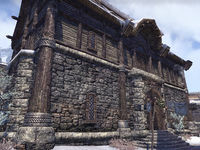 Fine urban living in Windhelm is now available at this commodious town home, which features a lofty main floor, two fireplaces, and a second-floor balcony. Alas, that balcony lacks a railing, which is how Grymharth, after too much mead, came to woe. 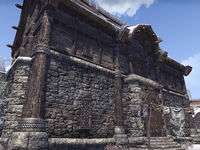 Grymharth's Woe is a medium player house in Windhelm. The house has no exterior at all; instead you are greeted by a spacious 2-story hall with a fireplace. On left there are stairs leading to a second floor and a small room under those stairs. At the top of the stairs there is a medium sized room with a fireplace and a doorway to slightly smaller room. It is conveniently situated very close to Windhelm Outlaws Refuge for those needing a quick means of escaping a thorny legal situation. Also nearby are the city's crafting areas, and Windhelm Wayshrine is a short walk away. This house replaced Stormcrag Manor in Update 12. This house is almost identical to Old Mistveil Manor save for the absence of the yard, full upstairs balcony and a small entrance foyer below the balcony. This page was last modified on 19 November 2018, at 07:15.